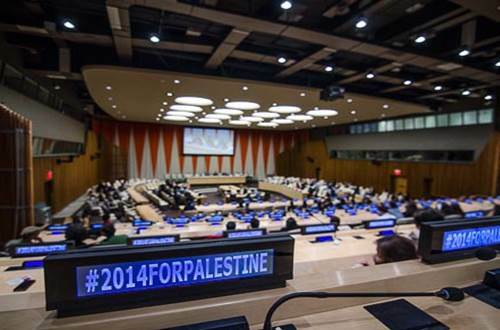 Guest post by co-star and producer Waleed F. Zuaiter following the screening of the Oscar-nominated Palestinian movie Omar at the United Nations in New York city on 1 May 2014, one of many special events taking place to mark the International Year of Solidarity with Palestinian People. Nominated for an Academy Award in the Foreign Language Film category this year, Omar is inspired by true events and tells a story that is all too familiar for Palestinians of the Occupied Palestinian Territory: resistance, betrayal, collaboration, survival, amidst the complex landscape of Israeli occupation. Omar is at the forefront of Palestinian consciousness. It builds on real events nurtured by the cyclical tragedy of occupation and the violence stemming from it. It captures a reality that transcends the social and political implications of collaboration, while, at its most basic core, telling a classical and timeless Shakespearian love story. World audiences in Ramallah, Sarajevo, or in Cannes expressed that the film’s boldness, humanity and simplicity invited them into the hearts and minds of the characters; describing Omar as an “epic,” “universal” and “soulful” film. With its bold ending, Omar tends to leave the public in an emotional state of shock. In addition, the perceived perpetual cycle of violence triggers many commentaries and observations. However, the film’s objective was to stay true to the Palestinian plight and to the inescapable circumstances of the story. Indeed, the last shot drops like a hammer blow of a harsh reality, but this is one very complex and sad. I wish this was not the case for the sake of all characters, including Agent Rami, who is also in my eyes a victim of the very system he is tasked with upholding. I sincerely hope that the honesty of Omar will help audiences around the globe grasp the complexity of the Palestinian narrative. This would be a major achievement for us, filmmakers. Though I understand Omar touches on what could be seen by many people as a sensitive topic, I sincerely hope that it will pave the way for the movie industry, and the public, to look beyond mainstream discourses surrounding the Israeli-Palestinian conflict and experience, through the movie, the loss of love and innocence, in a world where people’s freedom and basic rights are constantly at stake. Omar has also a critical role to play, being one of the first films almost entirely funded by Palestinians. Actually, 95 per cent of its investments come from private Palestinian equity partners. Economic independence and free creative expression are necessary means to celebrate Palestinian identity. Omar has the potential of acting as a role model for the development of a local industry where Palestinians worldwide would tell their stories, through their own means, claiming ownership of the creative process, investing in new talents and the unique Palestinian experience. This is a form of nonviolent cultural resistance which, for the case of Omar, attracted the support of some of the largest Palestinian companies and organization and benefited from the work of a talented cast and crew, mostly Palestinians. Screening Omar at the United Nations was an amazing experience and symbolically very important to share Omar’s story with the world. I hope the film took the audience through a thrilling journey and sparked conversations and even actions towards the goal of a comprehensive, just and lasting peace, with the end of the occupation, freedom and equality for all. PreviousWhy apply for the UN Summer Academy 2014? NextWho is Secretary-General Ban Ki-moon supporting in the World Cup?